Sheridan attempts to stop Earthforce from merging a human pilot with a Shadow ship on Ganymede. "And they have much to be concerned about. There's always the threat of an attack by, say, a giant space dragon—the kind that eats the sun every 30 days? It's a nuisance, but what can you expect from reptiles? Did I mention that my nose is on fire, and that I have 15 wild badgers living in my trousers?" -Marcus Cole, after referring to an "important package" last episode, smuggles a former Interplanetary Expeditions (cf. 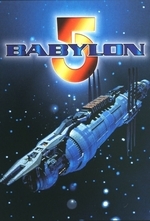 every episode about unethical natural resource exploitation or archaeology) employee onto B5, dodging assassins targeting her all the while. She says they discovered an ancient ship on Ganymede, and Earthforce intends to use it. -It is, of course, a Shadow ship. They had also previously discovered a Shadow ship on Mars (which Garibaldi confirms), but another Shadow ship came by and freed it and they flew off together. -There's a few big problems with any attempt to stop this plan. 1) Nightwatch is getting increasingly aggressive on B5 (and secretly plan mass arrests of high-ranking officials because of a suspected conspiracy). If Sheridan goes, his absence will be noted. 2) Earthspace is littered with lots of early-warning beacons. Since the White Star is effectively a ship from an unknown alien race, as far as any observer can tell, this will lead to an immediate shitshow, and might also expose Sheridan's part in the Conspiracy. -Sheridan and Delenn go anyways. Nightwatch does, in fact, note his absence. -They arrive at Ganymede, the massive moon of Jupiter (triggering an alarm), but they are too late! A human is being merged with the Shadow ship to take control of it. The merging goes... poorly (Delenn says because of poor prep), the Shadow ship goes mad, blows up Gaynmede base, and then starts chasing the White Star. -The White Star does a tricky thing and manages to get the Shadow Ship caught in Jupiter's massive gravity well, crushing it at Jupiter's heart as it falls deeper into the gas giant. Yay! -...but then the EAS Agamemnon, Sheridan's former ship, arrives to respond to the alarm. It can't/won't enter Jupiter, but shoots at the White Star from above as the White Star skirts under some gas clouds. This situation is untenable: Sheridan doesn't want to damage either of 'his' ships: the Agamemnon and the White Star both. -Delenn suggests creating a jump point in the atmosphere to escape. Lennier, who has been playing the role of "risk-exposition Lieutenant Commander Data" this entire time ("Captain, that will [bad thing]..."), notes this will cause a massive explosion. Oh well! They manage to pull it off and escape. -At the end of the episode, they receive a message from Earth. President Clark has announced that an alien ship attacked and destroyed Gaynmede base, and was chased by the Agamemnon to Jupiter. Because of this new alien threat, Clark has declared martial law. -There's a fun cold open about breakfast foods in which Garibaldi is told to "shut up and eat it" and Ivanova gets a gift of a very expensive fresh breakfast from Marcus (in return for getting him an identicard and absolutely no other reason, of course). They later have an argument about Marcus' place in the Conspiracy; he later returns with an org chart showing his exact position, making Ivanova laugh. -Delenn and Sheridan talk onboard the White Star before the battle. Sheridan talks about how his father once helped him sleep by spraying the roof with a hose, to mimic the sound of rain; Delenn orders the ship to play a rain sound and promises to catch Sheridan if he falls off the sharply inclined Minbari beds. -Garibaldi visits G'Kar. G'Kar is rapturously happy in prison as he feels his life has meaning. He is writing a memoir of his life and the Narn, and how to correct their failures.